WITH THE help of the Tories, Blair got his plans to start the 'renewal' of Trident, Britain's nuclear submarine system, passed through parliament on 14 March. It showed Blair's reduced authority in his final days, however, that 95 Labour MPs joined a 'backbench rebellion'. Many people are sceptical of Trident's role. It is patently not the 'ultimate insurance policy' that Blair claims. It would make the world a more dangerous place. Each one of its 160 new nuclear warheads could wipe out over half a million people. It is not an 'independent' nuclear deterrent - US imperialism is in charge of the technology and could put a veto on its use - Britain would become even more dependent on capitalist politicians like Bush. Its cost is horrendous - around £76 billion when you count the running costs over three decades. When spending on the NHS, education, pensions etc., is threatened, people ask why are so many billions being wasted on Trident? 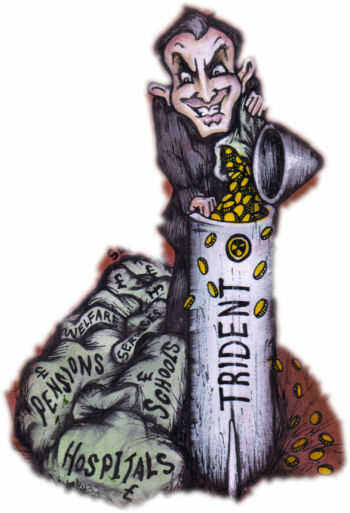 Half the Labour MPs in the Commons, including Tony Blair, were in the past members of the Campaign for Nuclear Disarmament. But it did not stop many of them voting for Trident. The voting was 413 for to 167 against, with 95 Labour rebels voting against, along with the Lib Dems and some minority parties. Under Blair, Labour backbench rebellions have been few. Vetting of Labour parliamentary candidates ensures that very few principled opponents of Blair's agenda even get to be New Labour MPs. Most Labour members keep quiet, hoping for advancement in their careers. In the case of Trident, Blair knew he could depend on the Tories coming to his rescue. The opponents included Charles Clarke, ex-home secretary, and three parliamentary aides - Jim Devine, Stephen Pound and Chris Ruane - who resigned to oppose Trident. Some opponents of Trident merely thought that the decision was being taken too early, to avoid causing problems in the early days of Gordon Brown's premiership. But socialists and opponents of Trident must keep campaigning. After the debacle of the Iraq war and some savage cutbacks in social spending, more and more people will be furious at throwing money at a scheme that defends nobody but adds fuel to the dangerous worldwide proliferation of nuclear weapons.